I've always wanted to fight genetically enhanced mercenaries while staring up Lincoln's nostrils. Alright, folks. We've got a lot to cover today, so you may want to go ahead and takes a seat. Or stand. Or sprint down tight corridors. Or whatever you people do to relax. 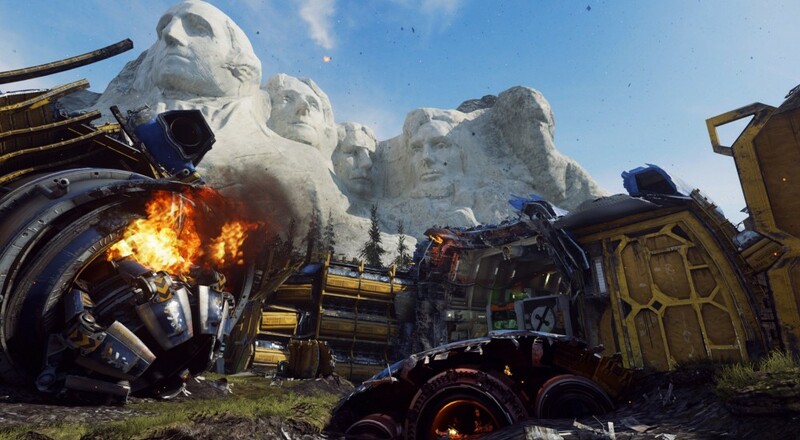 First things first, Xbox One and Xbox 360 users will have access to the latest Call of Duty: Advanced Warfare DLC on March 31st. This new pack, titled "Ascendance", will feature a whole slew of new goodies for anyone who just can't get enough arcade shooter in their life. Four brand new maps are on their way, as per Call of Duty tradition, each capitalizing on the iconic cyborg suit's new Exo Grapple ability. The locations, titled Perplex, Site 244, Climate, and Chop Shop, will take players from a climate-controlled utopia to the wreckage of an alien ship conveniently located right below Mount Rushmore. "Grappling's for the elderly and the morbidly obese," I can hear you saying. Fair enough. Perhaps you'd be interested in the new weapon on offer, an energy-based LMG/shotgun hybrid referred to as OHM? What if I told you it came in a sweet custom "Werewolf" variant? Still not interested? Fine. Geez. I guess I won't worry about mentioning that we finally get to check back in on John Malkovich and Co. in the next Exo Zombies episode, Infected, or that it's set just outside an Atlas facility and features the subtly-named Burgertown restaurant. You know what? I'm glad I don't have to worry about mentioning that Season Pass holders already have access to the OHM. It's not even worth it. "Ascendance" will be available on its own for $14.99. Playstation owners have yet to receive a release date, but it's likely that the month-long exclusivity attached to the "Havoc" DLC will apply similarly here. Page created in 0.4325 seconds.